Our natural foods are all safe products selected under the following three general standards. We strive to use safe agricultural products, where no agrochemicals, chemical fertilizer, or herbicide have been used for more than three years. We do not use any food additives whether natural or synthetic, as they are considered to be highly toxic. We do not use any food products made from genetically modified crops. 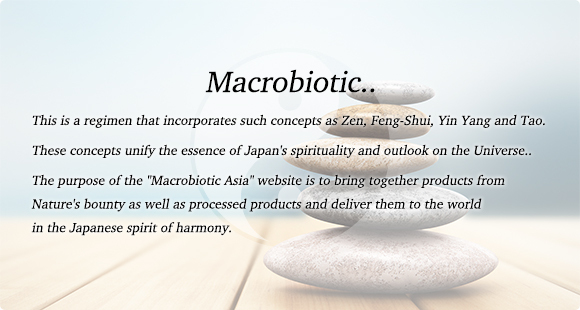 For products that pass the criteria above we also select our food products based on the macrobiotic philosophy. We do not handle any imported goods contaminated by post-harvest treatment or fumigation. Animal products, such as beef, horse meat, and pork are not allowed. The only exception is seafood, which we allow in some cases. We do not use any refined sugar, such as white sugar, granulated sugar, etc. F.ex. Long term ripening method for miso (soybean paste) and soy sauce, and compression method for oil. Based on the above mentioned standards, we offer you safe and natural food products essential to maintaining your daily health. We also supply luxury foods improving your living standard, as well as dietary supplements. Besides food, we also offer a variety of products made to support a pleasant lifestyle, such as soap/detergent, health cookware, water cleaners, cosmetics, books/DVDs etc. ● Why use non-agrochemical and organic farming? Since our foundation, we have been offering our products based on the unique and strict standards listed below. As for organically grown products such as rice, we carefully select farming methods and producers regardless of JAS authorization, based on standards stricter than the revised JAS act. Just like humans who use too much medicine weaken their body’s natural defense systems, soil who is continuously fed with agrochemicals loses it’s original power and gradually becomes sterile. Furthermore, the agrochemicals accumulated in vegetables and grains is introduced into the human body when eaten, disrupting the body balance and leading to diseases which are hard to diagnose. Crops grown organically using as little agrochemicals as possible are full of vitality and taste. These provide rich nourishment for the humans who eat them, and give them the power to stay healthy. We hope that the soil, water and air, which are all sources of life, should be kept clean forever, and that they will continue to raise healthy living beings on earth. With this in mind, we try our best to continue providing natural, safe and nutrient-rich food products. We hope that the earth, water and air, which are source of life, should be kept always clean, to continue to raise natural lives healthy on the earth, we are trying our best to continue providing safe and nutrient-rich food products. ● Why avoid genetic modification? All the living organisms on the earth influence each other, and this prosperous co-existence maintains the environmental balance. However, genetically modified products have nothing to do with this environment. There is a danger that they will damage even what environment have already given us, and again, provide very little to preserve this environment. All this might lead to the destruction of this natural balance. Someone once said that "The human body is a micro-cosmos’. Thus, introducing genetically modified products into one’s body may very well disrupt the body’s balance. The human body rejects unidentified substances which it has no experience, and tries to drive them out. If this process of driving out unwanted visitors becomes too hard, you lose body strength and it becomes easier to fall ill.
At the present time, there is no conclusive evidence whether genetic manipulation is safe or or not, but we think it would be better to avoid these products from a commonsense standpoint.